1 LOCAL OWNER 6.2L AWD -- NAVI & REAR DVD -- QUAD BUCKETS CLEAN CARFAX! 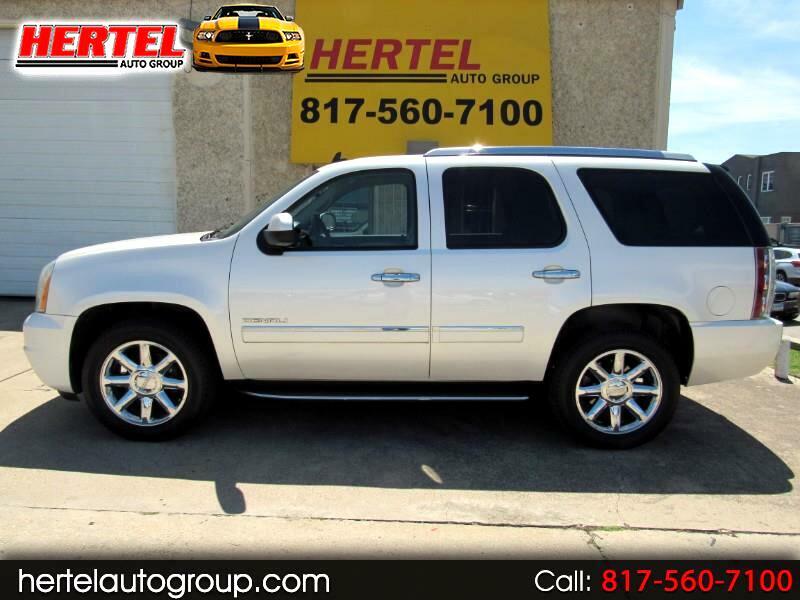 Hertel Auto Group is pleased to offer this absolutely gorgeous, fully-loaded, powerful-performing 2011 GMC Yukon Denali All-Wheel-Drive Luxury SUV for Sale in Fort Worth Texas. Bought brand new out of Fort Worth Texas in January of 2011, this one must have been owned by a travelling salesperson of some kind because while the miles are higher than average, so is its condition. The rear seats look like they hardly set in and the rest of this rig is as nice as you'll find anywhere. Don't let the odometer reading dissuade you either. These Yukons; Chevrolet Tahoes; Chevrolet Suburbans and GMC Yukon XL engines are regularly reported to go 250-280K miles and more. They're built to last and this one doesn't appear to be any different. If you've been looking for the ultimate family or multi-passenger travel vehicle, here it is. Arguably - outside of its corporate cousin the Cadillac Escalade - the most highly-sought-after ultra-premium luxury SUV on the market, the Denali Trim sets you apart from pedestrian Chevrolet Tahoes and other GMC Yukon 1500's on the road. From its distinctive "Denali Chrome Grille" to its stealthy black stance and 20" Chrome Wheels, this is a model lineup that everyone recognizes as top-of-the-line. After being completely redesigned for the 2007 model year, the Yukon XL Denali sauntered (that's the word a vehicle like this deserves to be used) into 2011 virtually unchanged. On the road, this GMC boasts GM's legendary 6.2-Liter V8 Powerplant that burbles with 403 Horsepower and 417 lb ft of torque. That's enough power to bluster your way onto highway ramps; surprise a few "sports cars" at the stoplight; or tow up to 7,800 pounds when properly equipped. Mechanically, it starts, runs, drives, shifts and performs exactly like you'd expect it to. All four 275/55R20 tires mounted on OEM 20" Chrome Wheels are in very good condition. For the safety conscious, this Yukon XL Denali features Stability Control (known as StabiliTrak on GM's) with a rollover sensor; AntiLock Disc Brakes, Side Curtain Airbags and OnStar (subscription required). In government crash tests, the 2008 GMC Yukon XL was awarded a best-possible five stars for protecting the driver and passenger in a frontal collision. On the outside, this rust-free Yukon XL Denali boasts what is arguably its best and most recognized color - Pearl White - that is complimented by an equally as as stately Tan Leather interior. Inside, the smoke-free interior of this GMC is as fully loaded as you could possibly expect to find in one. How loaded? Got your popcorn ready? This is a lonnnng list of moving credits. Get it? Movie(ng) Credits? Popcorn? Okay...enough with the poorly executed humor and let's get on to the list of amenities. This Yukon Denali features Leather; Heated & Cooled Front Seats; Heated Steering Wheel; Heated Rear Seats; Quad Bucket Seats; Factory GPS Navigation; Backup Camera; Rear Parking Sensors; Power Sunroof; Power Adjustable Foot Pedals; Rear-Mounted DVD Entertainment; Rear Climate & Audio Controls with Video Inputs; Dual Electronic Climate Control; Woodgrain Trim; Premium BOSE Audio; Power Windows, Locks & Mirrors; Cruise Control; Cold A/C and More! As with any pre-owned vehicle, it does have the usual amount of cosmetic imperfections that are inherent to a vehicle of this age and mileage. We invite you to view all of the photos that are available on our Web Site and determine for yourself if it meets your expectations for a vehicle of this age and price. If it does, we then welcome you to stop by for a viewing and test-drive of this uber-luxurious 2011 GMC Yukon Denali 1500 4x4 Full-Sized Luxury SUV. Given its equipment, trim level, ownership history, condition and low mileage, we've priced it fairly in the marketplace and expect it to sell quickly. Don't let it pass you by!